Ever since Jose Garces became an Iron Chef, I have been wanting to try his restaurant. Mercat a la Planxa is a Spanish-style tapas restaurant with their speciality involving the a la planxa (pronounced "a la plancha") cooking style. This simple preparation is done on almost every type of seafood or meat imaginable. After arriving at the restaurant, the decor was amazing. A huge open air kitchen exposes the entire dining room to the food preparation scene. Overall, I thought the food was very complex with huge variety of flavors that complimented each other. The dishes are small and the prices quite high, but what can you expect for an iron chef's restaurant. Definitely come with a group so you can try a huge variety of his dishes. While I was writing this review, I kept flip-flopping between a 4- and a 4.5-mile rating. I decided on the 4-mile rating mainly because of the overall service. I felt as if the waiter kept trying to make us order more and more (sometimes suggesting we double our order of a dish) and then insisting after we would decided not to. Also, for eating at the restaurant for a couple hours and watching tables come and go, I still felt as if we were somehow being rushed. Hopefully others didn't experience the same. I believe it was last year when bacon wrapped dates became the trendy appetizers to offer at Chicago restaurants. Mercat's twist stuffed them with marcona almonds and still wrapped them with bacon. Two orders was needed to have enough for my family of 5 to try. Each mini skewer had two bacon wrapped dates on it. Once again the sweetness and saltiness was a great combination and the marcona almonds inside gave a more rich, nutty flavor sort of like a macadamia nut. A good twist on a more common appetizer. Whenever I see croquettes on a menu, I always enjoy ordering them. These crispy spheres of serrano ham and cheese. They say there was chorizo mixed in, but I couldn't make it out, especially over that amazing romesco sauce. Romesco is a red pepper based sauce which was the best part about the croquette. Everyone used their forks to scoop up the rest after finishing the croquettes. This was without question the BEST dish of the night. We order the paella negra because of all the seafood that was listed underneath in its description. The funny part was that I didn't even realize the "black rice" was black because of the squid ink used in the preparation. Anyway, it was a fairly large vat of the black rice with mixed in pieces of chopped calamari and topped with half of a lobster, scallops, head on shrimp, clams, and mussels. Also piled on top was a cherry tomato salad with plenty of fresh cilantro, artichoke, and pieces of saffron aioli toast. All of the seafood was extremely fresh with even my little brother wanting more and more of the mussels. The lobster was decent sized, but I did wish it came with the other half as well. The shrimp were my favorite because the heads contained so much juice and flavor (make sure to not waste it). I thought the tomato was a nice touch because it gave a nice sweetness and acidity to the rice. The squid ink rice is not fishy, but there is a squid flavor. I highly recommend this dish, but just be aware, it does take about an hour to prepare. Before the dinner, I had heard great reviews about their flatbreads. Everyone seemed to enjoy them so we decided to order a couple. The first was a porcini and catalan sausage flatbread with chopped garlic and manchego cheese (a spanish sheep cheese). The flatbread was pre-cut into four slices which were not more than an inch wide and a couple inches long. The porcini mushroom flavor was strong definitely overpowering any sausage-like flavor. Same with the cheese... I couldn't say it added much. This flatbread was just ok. The other flatbread we ordered was topped with beef short ribs, horseradish, bacon, and parmesan cheese. The actual bread was similar... thin, crispy, and not much flavor besides the toppings. The beef short ribs was piled pretty high (nearly half and inch thick) on such a thin crust. The rest of the ingredients weren't very prominent, but that didn't matter because the short ribs were that good. This was the better of the two flatbreads we ordered. So I wasn't sure exactly what we ordered when getting this dish. I didn't realize at all it was an Indian-inspired dish. The roasted suckling lamb was served in a red curry sauce mixed in with some chick peas. It had a few slices of grilled naan. I did wish it came with a lot more of the flatbread naan because we had plenty of the curry leftover. Rather than asking we just ate the curry... not too spicy, and definitely reminiscent of being in India a few years back. When hearing their speciality was cooking style known as a la planxa, we had to order a few of their recommendations. The pulpito or baby octopus was my little brother's choice. It was a simple preparation of the baby octopus... grilled and topped with a little cilantro oil, micro greens, and lemon. The octopus was tender and very fresh. I really enjoyed the simplicity of the dish. The salmon might have been the most disappointing choice of the night. It was a small filet of salmon cooked a la planxa style with skin on. It was served with the same lemon and micro greens. The price for all the a la planxa options is pricey and the salmon was nothing special at all. I wouldn't order it unless you like bland pieces of fish. Now the lamb was the recommendation by the waiter... letting us know this was the most popular item on the menu. We ordered the half order which came with two bone-in lamb chops along side a mint aioli and I believe it was the romesco sauce similar to the croquettes. The lamb was extremely tender, grilled to a perfect medium rare, and when dipping it in the sauces, was simply amazing. I enjoyed eating the meat right off the bone. I would come back for this dish for sure. Such a simple dish made extremely well. 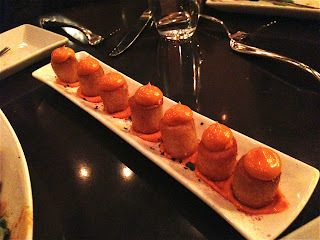 These fried cylinder-shaped potatoes were topped with a spicy aioli and served sitting on top of the same spicy sauce. Just be careful, these were hot, temperature-wise that is. Overall though, the spiciness wasn't really an issue. This was one of the greatest spins on what I like to think was a s'more. Milk chocolate was lightly breaded and fried making them croquettes. Each was served in a pillow of banana marshmallow cream with a drizzle of both arbequina oil and a rosemary caramel. Biting into a croquette released the melted chocolate and eating it with everything else was the perfect s'more. The arbequina oil adds a strong perfumed oil and reminded me of a cilantro. This may be a little too much for some, but give it a try. The last dessert we decided to split was a lemon curd cheesecake with yellow cake and a blueberry creme fraiche ice cream. It had a nice sized pile of blueberries. This was one of the dishes that the waiter tried to make us order two of. I didn't understand why because it was enough for all of us to share, especially when we already explained we just wanted a bite or two each. Anyway, the cheesecake was definitely lemon flavored and the blueberries were as sweet as can be. Unfortunately, it was nothing unique, so if you want to try something new... don't order this ordinary dessert. My usual disclaimer about not knowing much about cocktails is still true, but I have been getting a little better. This drink had a strong pumpkin flavor from the syrup and spices they added. I forgot the name of the cocktail but if you read the ingredients you will find it. Just make sure you like pumpkin. - When ordering, I suggest ordering two to three dishes per person plus a paella. The overall sizes are small--maybe a bite or two per person. - Valet Parking is available - $14 (the valet parking is the same as the hotel next door (Hotel Blackstone), just make sure to have them validate the parking ticket). - I highly recommend the Paella Negra... just make sure that you enjoy squid ink or at least will entertain the idea that the rice is covered by it. - Don't fall into the trap of the waiter trying to convince you to order more and more... The plate sizes are small, but I think ordering multiple dishes is a much better option than ordering multiple of the same dish.